When Jye popped into a work meeting, AJ was instantly attracted to his confidence and vibe. AJ was living in Sydney and Jye in Newcastle where they would meet again when a mutual friend convinced her to stay and celebrate after completing a management course. What does a Mexican use under his carpet? I was hooked – he was a moron. After a weekend away with nights around a fire - talking, listening to music and planning their life together - AJ moved in. Two months later, they got a puppy, Charlie and started saving for their home. Life was moving quickly for this magical couple. Fast forward one year whilst on a trip to Mexico, Jye proposed. An event at their resort meant his plans for a beach proposal were disrupted, so they retreated to their room where he got down on one knee and asked his best friend to spend the rest of their lives together. It was tequila all round! AJ and Jye had their hearts set on a vintage/rustic feel with a modern twist for their wedding day and were happy to experiment with things that were unusual or different. Opulent colours of deep wine burgundy, with purples, ivory’s and gold rounding out the palette. With inspiration taken from the 1940’s, the suits reflected this theme, while AJ and her Maid of Honor’s dresses were beaded to reflect the Gatsby era. The florals were to be unstructured and unusual; highlighting the theme colours, giving a modern rustic element. AJ’s hair was styled in a faux bob to reflect the vintage era. Modern makeup and a bold deep wine lip tied AJ’s look together. Elegant, Classic, Stunning. The ceremony and reception were held at Caves Coastal Bar & Bungalows. Selecting a non-traditional ceremony, Jye and AJ’s celebrant had them fill out a questionnaire, which meant they heard their story for the first time, along with friends and family. ‘Our whole ceremony was a surprise! Hearing what was put together was incredible; it was the best part of the day for both of us. We had so much fun and smiled the entire time!’ says AJ. Thank you for sharing your love story with us Mr. and Mrs. Collinson. Do you have fine hair or feel like you might need extra volume for the hair style you want to wear on your wedding day? Bridal hair styling can be quite confusing for you as a client - you know what you would like but is your hair long enough or thick enough? Working with an experienced hair stylist, all these questions will be answered at your trial. There are a few different options which will enhance your style. The options that I choose to use are for special occasion and can create your desired look without damage to your hair. Clip-in extensions have been used for this style. CLIP-IN HUMAN HAIR EXTENSIONS These hair extensions are designed to be removed after your special occasion with no damage to your natural hair. Designed to provide extra volume and maybe some added length. For the best results make sure that your extensions are human hair so that they may be colour matched and heat styled. Look for key words such as, double or triple remy - meaning silky or smooth in texture. Clip in extensions can be purchased in 18", 20" or 22" lengths. PADDING is used to create the illusion of having lots of hair when you may have finer hair- never fear padding is here! Placement of your padding will depend on where you would like to create your fullness in your upstyle. This is easy to use and very affordable and will make all the difference with your desired look. You may have or have used a padding called a 'donut'. These paddings have become extremely popular for clients to create the timeless ballerina bun. Your hairstylist will have variations of this style of padding to create a more enhanced version of your chosen upstyle. 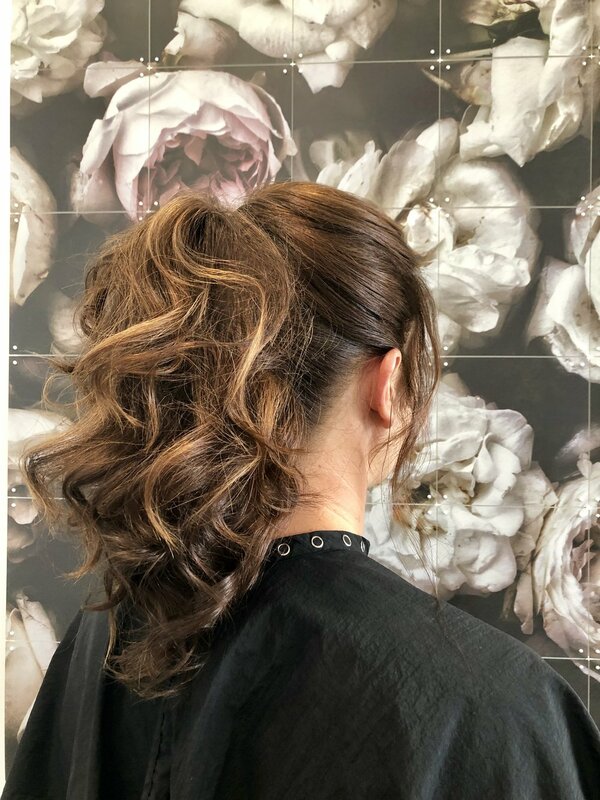 So whether it be a classic chignon, a ballerina inspired bun or to build volume in your romantic updo, padding is an excellent styling secret. Padding has been used here to build the volume out in this style. HAIRPIECE similar to the clip-in extensions, a hairpiece is a human hair piece that is added as one into your upstyle. If your dream style requires extra hair your stylist will colour match a piece to 'fill out' your own hair to create your desired look. It is still very important to use a quality piece so as not to see the difference between the piece and your natural hair. This style has had a human hair piece added. 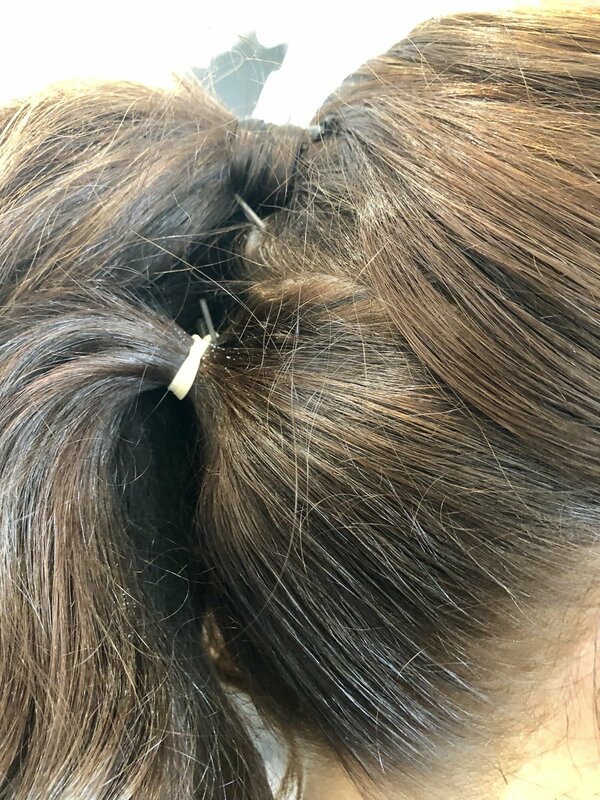 At your trial you will be able to discuss this with your stylist to find out which of the three options will work better for you.